Wonderful home! Amazing views! Clean and comfortable! We found the best! After several years looking on Deal Island and surrounding communities, our family found exactly what we were looking for here! Our family enjoyed every part of this beautiful home on the Bay. The kitchen had every utensil, pot, pan, etc. that you could think of! The beds were extremely comfortable and the rooms are HUGE! There's a whirlpool tub located between the 2 master bedrooms on the second floor. It looked very inviting, but we could not pull ourselves away from the outdoors to enjoy it. Great, quiet location, close enough to the water to hear the waves, and the passing fishing boats, but far enough away for the kids to enjoy yard games while the adults relax on the sun porch, or the deck. The fishing from the pier on the property is excellent, and the crabbing even better! The kids spent HOURS each day at the beach, located just steps from the back door of the house. The kayaks provided are well maintained and provided the kids (and adults) with many hours of fun and exercise. I am anxiously awaiting my vacation schedule for next year so I can book our next vacation. The entire family is insisting that we return to this Deal Island home! Yuri, thank you for allowing my family to rent your home! We look forward to returning next year, and we will plan on staying longer!! House is older, but extremely clean, stocked and well kept. Dock, small private beach, and views were all amazing. Not sure if this was particular to the time of year, but I also didn't see A SINGLE MOSQUITO, which I wasn't expecting anywhere on the eastern shore. There are LOTS of dragonfly's, but they don't bother people, look kind of neat, and I suspect eat all the mosquito. A great weekend away from civilization with the family. We stayed in June and enjoyed the amazing views, the pier for crabbing and fishing, and the beach. The beach may as well have been private, because we were the only ones who used it all week. The rental was budget friendly, probably due to its seclusion and 20 minute drive to Princess Anne, but the accommodations exceeded typical beach cottage rentals... The upstairs bedrooms, each with private bath and million dollar view, are great for large families. 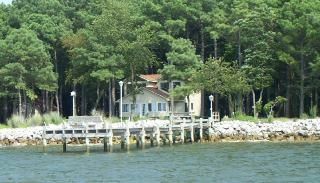 We visit the Chesapeake annually, and this is among our favorite properties. Enjoyable, lovely and a great way to spend time with family and friends. This home has a beautiful Bay view! Great Bay views from both upstairs bedrooms. We had a wonderful week at this house. My son caught lots of crabs from the dock. The home says there is a whirlpool tub but the water to fill the tube is green. The little beach next door was perfect for our kiddos. We did have some difficulty in dealing with the owner. Deal island is a great place to get away from the regular hustle and bustle. We are sorry we had to charge this renter for damaging our new solid wood floor in front of the wine/soda cooler. They claim they didn't do it and didn't use it, yet the floor was perfect before the rental and was water soaked and swollen when they left. We own, manage, and personally clean and inspect our home after each and every rental. We understand damages are not malicious, but if damages are done under your rental term you will be charged for damages. We strive to ensure each and every renter has a wonderful experience in well kept bay front home, this is why we have a minimum age and security deposit. We enjoyed our stay very much. We all commented on how well equipped the home was, especially the kitchen. The view and sunset are not to be believed, we kept taking pictures and sending to our families. Very relaxing, great beds, we had a great time and will be back!